The high school's speech and debate team has been ranked among the top 10 percent of schools nationwide! The team was named to the National Speech & Debate Association’s prestigious 100 Club based on competitive and service related activities. The honor recognizes Stillwater’s outstanding commitment to teaching students essential life skills including communication, research, listening, writing and organization. School board meetings will be held in the media center of the former Oak Park school starting with the Oct. 11 meeting (see meeting agenda). As always, meetings are open to the public. This new location provides a more informal and welcoming meeting venue for community members to stay connected with the board. Planning to attend? Enter the building from the west entrance off of Osman Avenue North. Can’t attend meetings in person? Watch the meeting live on YouTube or on Cable Channel 15. You can also watch archived videos on our website. The school board will be holding a work session on Wednesday to discuss possible budget reduction options to address the current $2.5 million general fund budget deficit. The administration is NOT recommending any of these items at this time, but is providing areas that could be considered as the board looks to find ways to address the budget shortfall and prepares for a decision on budget reductions in December. The meeting will be held from 8 a.m. to noon on Oct. 10 at Central Services. A video of the meeting will be posted online following the work session. Rutherford students came together Friday to hear an important message of kindness from a young man who knows a little bit about being different. 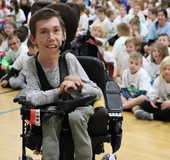 Author Shane Burcaw visited with second, third, fourth and fifth graders and shared stories of what it is like to live life in a wheelchair and rely on the help of others. Burcaw is the author of a children’s book called, Not So Different: What You Really Want To Ask About Having A Disability. Read more. Congratulations to Stillwater Area High School activities director Ricky Michel who was recently inducted into the St. Croix Valley Athletic Association Hall of Fame! Watch this video to hear what the SAHS alum (Class of 1981) has to say about the honor. The school board will host a meet and greet with legislative candidates on Thursday, Oct. 25, 2018 at 5:30 p.m. at the Oak Park Building, 6355 Osman Avenue North in Stillwater. See official meeting notice. October 10: E-cig and vaping conversation for parents, Stillwater Area High School auditorium 7 p.m. RSVP online.